We have a lot of breakfast potlucks at work and sometimes I struggle with what to bring. 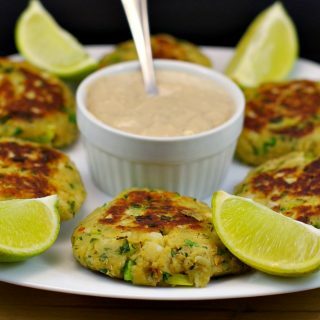 I have found that there aren’t that many quick and easy ideas for breakfast potlucks out there, especially something that can be made in advance. The beautiful thing about this Cinnamon Roll Breakfast Lasagna recipe is that it is made with packaged prepared refrigerator cinnamon rolls and can be whipped up in less than 30 minutes the night before or a couple of days in advance. It not only makes a great brunch potluck recipe, but also a wonderful holiday breakfast or brunch. In fact, this sweet breakfast casserole is even better if it is made in advance because it gives the cinnamon roll layers a chance to soften up. And it will keep well for a few days in the fridge. 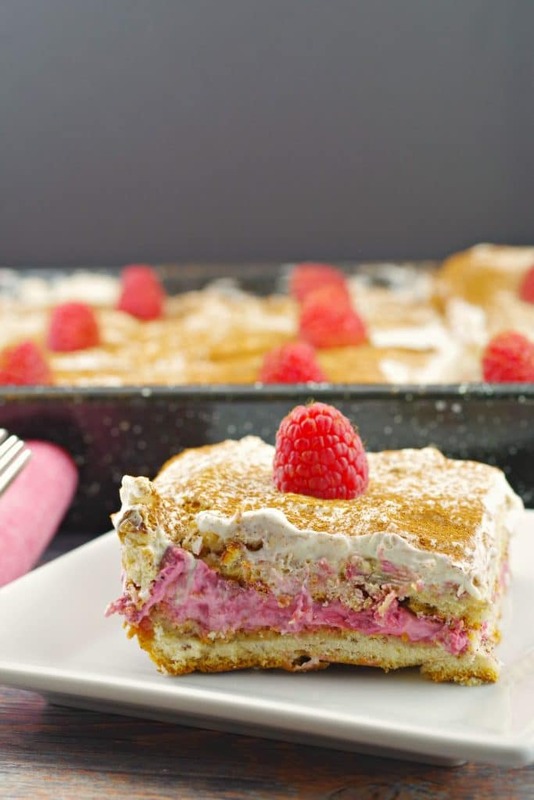 A little different than the usual breakfast fare, this raspberry cinnamon bun lasagna satisfies the sweet tooth and is simple and quick to make. It’s also great for serving a crowd. Because make- ahead breakfast and brunch potluck recipes are not easy to come by and because of all the breakfast/brunch potlucks we’ve have at work over the years, I’ve created several breakfast potluck recipes and these Maple Sausage Brunch Bites, this Perogy Breakfast Casserole and these Raspberry Lemon Scones are a few of my faves! They can also be made in advance. So, if you are looking for make ahead breakfast casseroles or Pillsbury cinnamon roll recipes for your next breakfast or brunch potluck, look no further. 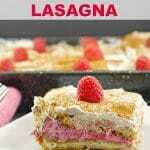 This recipe also makes a great dessert lasagna! 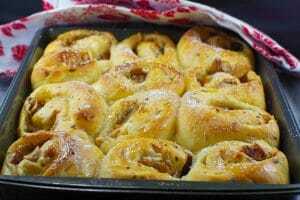 And if you love cinnamon rolls, try my Gruyere Apple Pie Cinnamon Rolls. You can make them in your bread machine! 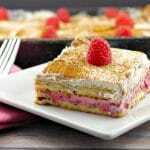 A quick and easy breakfast/brunch potluck recipe or dessert lasagna made with packaged cinnamon rolls and icing (so there is no waste), whipped cream and frozen raspberries. It's a unique and tasty Pillsbury cinnamon rolls recipe! Spray two 9X13 baking pans with non stick cooking spray. Roll out each package of cinnamon buns as flat as possible and press into bottom of each 9X13 pan. Ensure the cinnamon rolls cover the entire surface of the pan. 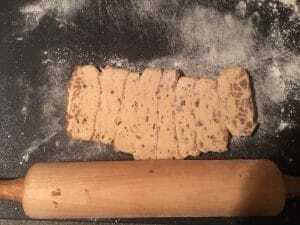 You can do this on a cutting board, then transfer to pan or roll out the buns right in the pan, if you have a smaller rolling pin (this is what I do). 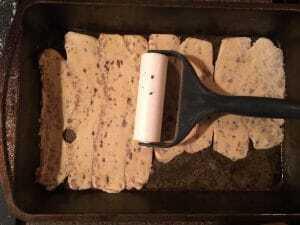 Sprinkle a 1/2 tsp lemon zest evenly over each flattened cinnamon roll layer in each pan. 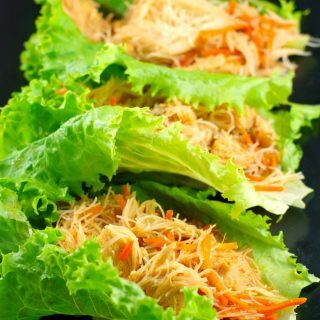 Bake for 10-13 minutes in preheated oven or until light browned. While cinnamon roll layers are baking, beat whipping cream to soft peaks. Remove 1 cup and beat 3 tbsp icing/powdered sugar into it at soft peak stage, then continue beating to stiff peaks. Beat remaining whipped cream to stiff peaks and set aside. In a separate mixing bowl, beat cream cheese and raspberry jam – then fold in the 1 cup whipped cream (with icing sugar/powdered sugar added). Fold in defrosted and drained raspberries. When cinnamon bun layers are done baking, remove from oven and cool for 5 minutes. Gently remove one layer and place on cooling rack. With a larg spoon, mix remaining whipped cream (about 2 cups) and the icing/frosting (that came with the cinnamon bun packages) together and add vanilla brewed coffee. Set aside. Spread whipped cream/icing mixture overtop of that layer. 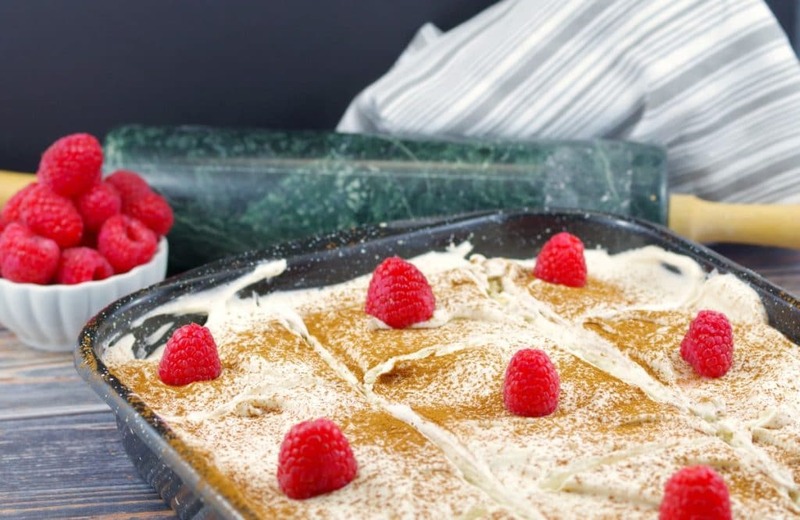 Garnish with cinnamon and raspberries and serve. Note: This is best served after leaving in fridge overnight, as it gives cinnamon roll layers time to soften. Well that would get the morning off to quite the start! Looks delicious. thanks, Sue! Yes, and then you could have the rest for dessert! That would make a gorgeous breakfast (which is my favorite meal!)! 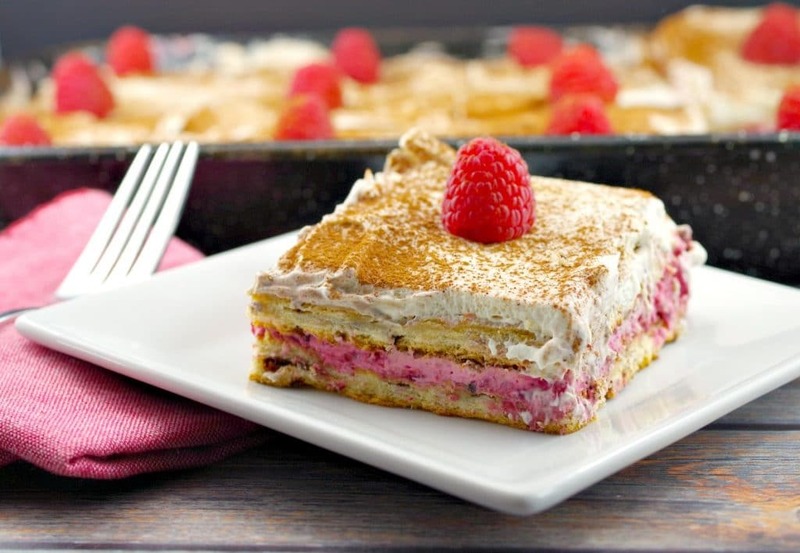 When I read raspberry mocha cinnamon roll I was intrigued, then I read lasagna and I was sold 😉 . Looks beautiful and so yummy! Thank you! Hope you get a chance to make it. It’s super quick with the packaged cinnamon rolls! Can strawberry jam be substituted? Hi Lee- you could but it will be a lot sweeter! I would at least use a low sugar jam and consider cutting back icing sugar in whipped cream, depending on how sweet you like things! And I would use seedless raspberry jam instead – it’s a bit more tart 🙂 Good luck and let me know how it turns out!